The laughter has barely died down from SOAP’s comedy The Long Weekend, but the local theatre group is set for more comedy with their next production, Love Loss and What I Wore, by Nora and Delia Ephron, based on the 1995 book of the same name by Ilene Beckerman. The production will be staged in early to mid March 2012, and will be directed by Jen Jensen, assistant director for The Long Weekend. Nora Ephron is an Oscar-nominated screenplay writer best known for When Harry Met Sally and Sleepless in Seattle, so this play mixes laughs and heart-tugging tears. Love Loss, and What I Wore is presented in “readers’ theatre” style with a cast of five women speaking directly to the audience as well as each other, in a series of monologues and dialogues. The cast discusses women’s relationships with their wardrobe at critical moments of a woman’s life. Clothing becomes a metaphor for women’s experiences: wardrobe malfunctions, puberty’s relationship with personal wardrobe, first date outfits, lucky underwear, prom dresses, favorite boots, irreplaceable shirts, the detested, disorganized purse, and experiences in the dressing room. The recollections about the clothing prompt the women’s memories about their mothers, boyfriends, husbands, ex-husbands, sisters and grandchildren. In 2009, the show was produced Off-Broadway. The production won the 2010 Drama Desk Award for Unique Theatrical Experience as well as the 2010 Broadway.com Audience Award for Favorite New Off-Broadway Play. The show has been produced on six continents and more than eight countries. 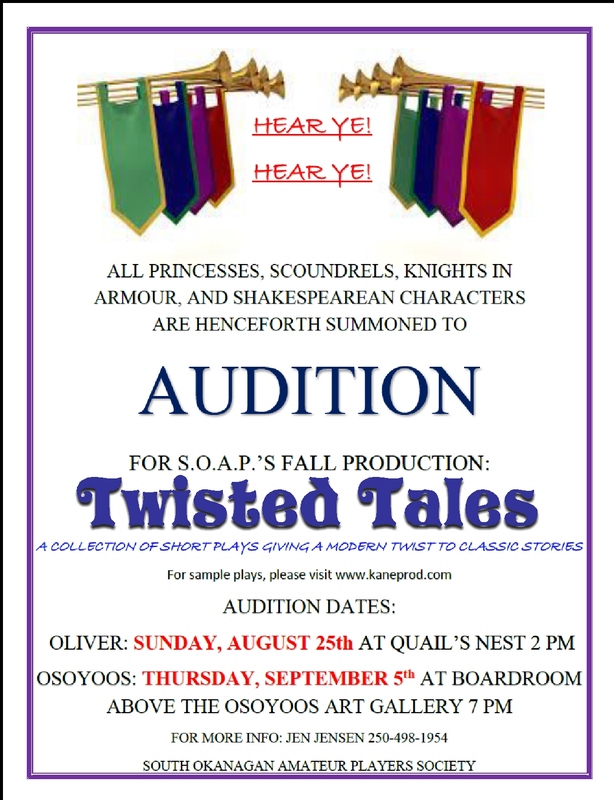 SOAP’s auditions run Sunday November 18 from 2 to 4 p.m. at the Osoyoos Art Gallery, 8713 Main Street, Osoyoos and Monday November 19 from 7 – 9 p.m. at the Quail’s Nest Arts Centre, 5840 Airport Street, Oliver. The audition is open to women of all ages – the cast represents women from young adulthood to senior years. New actors are encouraged to try out. Call 498-1954 or soap @ telus.net for more information. Women invited to audition for SOAP's "Love Loss and What I Wore"
The South Okanagan Amateur Players are holding open auditions for their fall comedy, The Wild Guys by Andrew Wreggitt and Rebecca Shaw, directed by Ted Osborne. In this Canadian play, four good-natured guys “take off to the great white north” on a men’s sensitivity weekend. This popular male bonding event takes city slickers into a wilderness setting to confront their primal fears and get in touch with their inner selves. Andy, a CEO and men’s movement advocate, and Robin, a crystal-gazing New Ager, coax Stewart, an unsuspecting grocer, and Randall, a sceptical lawyer, into reluctantly participating in primitive rituals and communal hugs. The weekend quickly unravels when the guys become lost and discover all their food has disappeared. The result? Hockey cheers and Neil Young singalongs! This play is a satire on men’s self-help encounters of the type made famous by drum-beating poet Robert Bly and the new-age, touchy-feely movement that supported it. The four male characters range from mid 20s to early 60s. The dialogue is fast-paced, funny, and easy to memorize. The roles are of equal size. Newcomers welcome. The production is scheduled for November, with rehearsals progressing from two to three times per week. Verdict so far on Twelve Angry Jurors? Great Show! The South Okanagan Amateur Players has been following rigorous tri-weekly rehearsal schedule in order to bring the crime drama Twelve Angry Jurors to the stage. Catch it this week in Oliver. The play is set in 1971 Chicago – the last year in which capital punishment was the sentence for murder in the state of Illinois. A jury which has just heard a murder case must decide the guilt or innocence of a nineteen year old “slum kid” convicted of stabbing his father. The defendant’s life is at stake. But the evidence suggests the case is open-and-shut. One juror cites reasonable doubt and stands alone in favour of a not guilty verdict. Over the course of the play each juror must confront their prejudices to separate fact from assumption. Will the majority pressure the sole juror into changing her vote to guilty? Will the arguing result in a hung jury? Or will a potential murderer be turned loose on the streets? The production opened at the OSS Minitheatre in Osoyoos on the November 5 – 6 weekend. The large Friday night crowd gave noisy appreciation throughout the show, gasping aloud at the dramatic and surprising turns of the plot, and chuckling at the play’s irony. The Saturday audience, although more subdued during the show, showed their approval with several murmurs and “ooohs” during the emotionally charged scenes and with loud lengthy applause at the curtain call. The production moves to Oliver this week: Friday November 12 and Saturday November 13 at the Frank Venables (SOSS) Auditorium, 8:00 p.m. Tickets are $15 adults and $12 seniors and students. They are available at the door or from vendors Sundance Video (Oliver) and Your Dollar Store with More (Osoyoos). Below the SOAP Players get into costume, makeup and hair backstage. Diane Gludovatz (Juror #11) and Leslie Hatherly (Juror # 12) show the “before and after” of makeup and hairdressing. Diane awaits her turn to apply the greasepaint and get into her wig , while Leslie is “stage ready”. Diane is a SOAP veteran comedienne in a rare dramatic role, and Leslee is a SOAP newcomer. “Keeping it in the family” are actors Darryl and daughter Chenoa Mackenzie (Foreman and Juror #5) . Both are veteran SOAPers. This will be Chenoa’s last opportunity to act with her dad before heading off to university, where she will continue her studies in the dramatic arts. Who’s the guilty one? These four jurors each have their own opinion. Darryl MacKenzie (Jury Foreman), Paul Tait (Juror #6), Michael Ryan (Juror #3) and David Badger (Juror #10) ham it up backstage before turning serious on stage. The cast and crew welcome you to join them for an exciting evening of live theatre. See (and hear) you in the audience! The South Okanagan Amateur Players are holding open auditions for their fall production of the gripping crime drama, Twelve Angry Jurors by Reginald Ross. In addition to the twelve main characters, three small roles and several backstage jobs are available. The classic thriller was first performed as a 1955 teleplay “Twelve Angry Men”, then as the 1957 film featuring Henry Fonda, Lee J. Cobb, and Jack Klugman. Its strong characters, tense plot, and important social themes have led the play to become a popular teaching script in highschool and college. The original screenplay has since been adapted for a combined male and female cast. When the play opens, a young man has just stood trial for the fatal stabbing of his father. The case appears to be open-and-shut, or is it only the stereotypes of his race, poverty, and youth that stand to convict him? Twelve jurors, locked in a claustrophobic and overheated jury room, must decide his fate. When a single juror raises the question of reasonable doubt, the others are forced to confront their discrimination, fears, and personal histories. Tempers mount to a tense climax as each juror is challenged to look at the facts without prejudice. Adult actors of any age, gender, and ethnicity are encouraged to audition. The jurors represent a cross-section of society, with diverse personalities, histories, and attributes. Director Ray Turner asks all those who audition to prepare a short dramatic piece (read or memorized) from any source material. The audition will continue with a group reading of the most dramatic portions of the script. Previous stage experience is not required: SOAP has introduced many new actors to the excitement of amateur theatre. The production dates are tentatively set for the first two weekends in November. Rehearsals will run two or three times per week, beginning the first week of September, on a schedule to be determined once the cast is chosen. SOAP is also seeking people with construction skills to learn set building techniques and help construct the basic set for the production. Auditions are on Wednesday August 25 at the Quail’s Nest Arts Centre (34274 95th St.) in Oliver, and on Thursday August 26 at the Osoyoos Art Gallery (8713 Main Street, 2nd floor), from 7 – 9 p.m. each evening. More information and an electronic copy of the play is available by contacting 498-3597, 498-7778 or . The South Okanagan Amateur Players’ spring production of Rumors by Neil Simon earned good reviews and enthusiastic applause during its six night run April 15 – 17 (Oliver) and 22 – 24 (Osoyoos). “Delivers on fast-paced laughs … (with) rapid style, good timing, and convincing antics” summed up the Osoyoos Times reviewer, “a delight to watch”. Ted Osborne directed the production, with Christine Rothwell as stage manager. Comments from the audience included “professional quality acting – as good as Vancouver”, “gorgeous costumes”, ” lovely set”, “great dialogue delivery”, and most common: “hilarious – I couldn’t stop laughing”. A bird’s eye view of the set, taken from the sound and lighting booth in the Osoyoos MiniTheatre. The home of Charley Brock, the deputy mayor of New York. Diane Gludovatz and Paul Butler as Cookie and Ernie Cusack, a cooking show host and a psychiatrist. Aimee Grice and Garth Robinson ham it up after curtain call in their roles as lawyers Chris and Ken Gorman. Aimee’s character Chris spends most of the play dying for a cigarette to calm her frayed nerves. Seated: Diane Gludovatz (Cookie Cusack), Jen Jensen (Cassie Cooper), Aimee Grice (Chris Gorman), Penelope Johnson (Claire Ganz) . Due to a double-booking in Osoyoos, the South Okanagan Amateur Players are rescheduling their spring production of Rumors. The comedy still opens in Oliver on April 15 – 17 at the Frank Venables Theatre at SOSS highschool. The Osoyoos dates are now April 22 – 24 at the OSS Minitheatre. 3. exchange the tickets at the vendor or the door for a different evening of the week (say, Thursday 8th to Friday 23rd). or contact or for assistance and information. The plot: Four couples arrive at a New York residence to celebrate the 10th wedding anniversary of the deputy mayor of New York. They find the wife Myra missing along with the servants, and the host lying unconscious in an upstairs bedroom suffering from a superficial gunshot wound. The couples represent some of the most powerful institutions in the state: the legal, financial, and medical professions, the media, and politicians. So, how do they handle a potentially explosive, gossip-laden situation? By spreading rumors and lies, of course. Be prepared to laugh as things go from bad to farce. After two months of rehearsals, the cast and production team are still cracking up laughing at the humour, which is a good sign that audiences can expect a very funny play. Who’s involved? Ted Osborne (Sound of Music, 2008) directs. A very capable newcomer to SOAP is assistant director and stage manager, Christine Rothwell. The ensemble cast includes several actors who’ve joined SOAP within the last two productions, Sand Mountain (2009) or Sound of Music (2008): Aimee Grice, Paul Everest, Patrick Turner, and David Badger. We welcome back Sera Lean (All in the Timing, 2003) after a too-long hiatus from SOAP. And two newcomers to the stage join the troupe: Garth Robinson and Calgary snowbird Paul Butler. Rounding out the cast are longtime SOAPers Penelope Johnson, Diane Gludovatz, and Jen Jensen. Paul Butler, a visiting snowbird from Alberta, is taking the plunge. Not off the diving board or hurtling from a ski jump, but something almost as daring. An early retiree from the forest product industry with no previous acting experience, Butler is taking centre stage in his first theatrical production. He joins the cast of Rumors by Neil Simon, a comic farce presented by the South Okanagan Amateur Players (SOAP). The same playwright also penned the comedy classics California Suite and The Odd Couple. “My wife and I saw all the posters around town advertising the audition, and I thought, why not?” The production runs Thursday April 8 to Saturday April 10 at the OSS Minitheatre (Osoyoos), and Thursday April 15 to Saturday April 17 at the Venables Auditorium (Oliver). The dates suited the Butlers’ holiday in the Okanagan, and so, much to the surprise and amusement of his wife, Paul auditioned and won a role. Butler plays “Ernie”, a psychoanalyst who is one of eight dinner guests invited to the tenth anniversary of the deputy mayor of New York. When the first couple comes on the scene, they discover the hostess is missing, the servants have disappeared, and their host is lying unconscious with a bullet hole through his ear. As guests continue to arrive, the attempted cover-up becomes more complicated and rumors run wild. When the police inevitably turn up, the socialites become desperate to maintain the facade, and the evening dissolves into deception and impersonation with hilarious results. “It ends up like a case of the patients running the asylum,” chuckles Butler, taking his cue from his role as the shrink. At first, his character keeps a professional calm, but as the tension mounts, Ernie’s composure begins to crack and he joins in the frenzied physical comedy. Judging by the nods and smiles from the rest of the cast, they agree: Butler’s daring plunge into acting has been worth it. After a brief hiatus during the fall, the South Okanagan Amateur Players are back treading the boards this spring with a production of the comedy Rumors by Neil Simon. The prolific and award-winning playwright also penned The Odd Couple and California Suite. Rumors is set at a posh dinner party to which several of New York’s socialites have been invited. When the first couple arrives, they discover that the hostess is missing along with the household staff, and that their host, the deputy mayor of New York City, has shot himself through the earlobe. Neither host nor hostess makes an onstage appearance during the entire play. As the evening progresses and more dinner guests arrive, wild rumours begin to circulate about their hosts’ marital problems. Comic complications arise when, given everyone’s upper class status, the couples decide they need to conceal the evening’s events from law enforcement and the media. As confusion and miscommunication mount, the evening spins off into classic farce culminating in an hilariously befuddled explanation to the police. Director Ted Osborne, last at the helm of SOAP’s production of The Sound of Music, is looking for a cast of 10 adults. Four men and four women are needed to play the dinner guests, ranging in age from 30s to early 60s. Two smaller parts are available for the police officers arriving on the scene, one middle-age man and one younger woman. No previous theatrical experience is required. Production dates are tentatively set for April 8-10 in Osoyoos and April 15-17 in Oliver. Actors must be available for a minimum of two rehearsals a week beginning in mid-January, but times and locations will be negotiated according to cast schedules. Closer to production, rehearsals may increase, as required, to three times per week. Auditions are on Monday January 11 at the Osoyoos Art Gallery (upstairs) on 8713 Main St., and on Tuesday January 12 at the Quail’s Nest Arts Centre, Studio Building, 34274 95th St., Oliver, just south of the Fire Hall. Both auditions run from 7:00 – 9:00 p.m. No prepared monologue is necessary. Actors will be reading from the script. Drop-in auditions are welcome, but hopeful actors are encouraged to stay for as much of one evening as possible to work through a variety of roles with other actors.